Buzz Words: All the Wrong Questions — Shouldn't You Be In School? All the Wrong Questions — Shouldn't You Be In School? 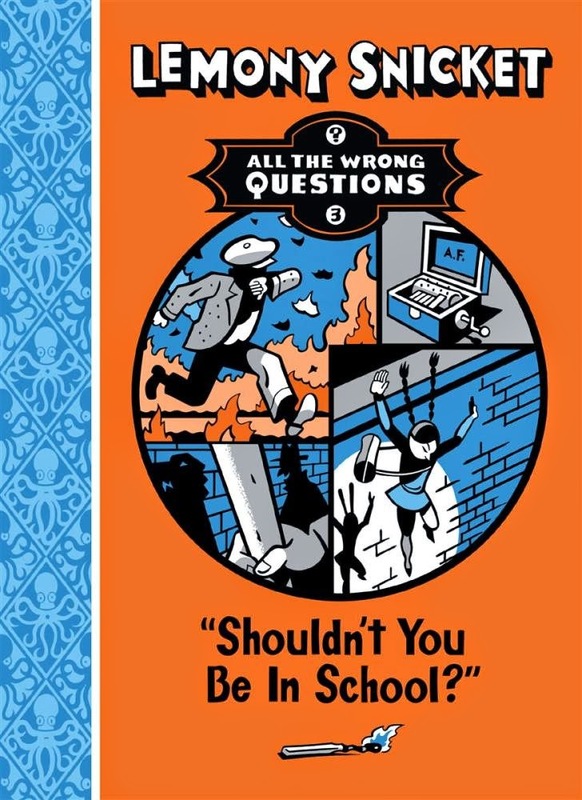 This is the third installment in the All the Wrong Questions series by Lemony Snicket. Sporting a striking fluorescent orange cover, Shouldn't You Be In School? gets straight into the action with the opening sentence: 'There was a town, and there was a librarian and there was a fire.' The distinctive voice of the main protagonist (also Lemony Snicket) carries the reader through a mystery that twists and turns. Although it doesn't quite get solved at the end, in this book there are a couple of answers along the way. In the town of Stain'd-by-the-Sea, there's a problem with arson, a crime which Lemony Snicket's chaperone, S Theodora Markson, attempts to solve. Starting at the very suspect Department of Education, an equally suspect Sharon Haines, directs them to a house that burns down. The innocent local librarian, Dashiel Querty, (the best name in the series so far) is accused and arrested. When the school goes up in flames as well, all the kids are transferred to the Wade Academy for a so-called 'top shelf education.' Lemony and his gang are found truanting and transferred to the school where they find out what is really going on. The old villain Hangfire is behind the whole thing. The gang consists of friends from previous books -- Moxie Mallahan (journalist), Jake Hix (chef), Cleo Knight (brilliant scientist), and Pip and Squeak, two kids who between them, drive a taxi. A newcomer is Kellar Haines, son of the misguided Sharon. Lemony Snicket is a character with secrets but so is Ellington Feint, a girl Snicket is equally fascinated with and distrustful of. It is Ellington who gives the friends strong coffee to overcome the laudanum they are drugged with at the school. But then she is an accomplice to the attempted arson of the library, part of Hangfire's dastardly plan. This return to the town with the Clusterous Forrest and Hungry's Diner is a slightly confusing but thoroughly enjoyable book for middle readers. Illustrations, complete with shadows, add beautifully to the quirky, fast-paced and clever story. The question is, whether the next book will have any answers, but maybe that is the wrong question!